Train4Less keeps you informed of the current trends in food and beverage and forces that are shaping the industry. Whether you are seeking a new career in the food and beverage industry, perfecting your craft, or researching the best training courses to provide your employees,Train4Less will help you plan and prepare for a successful future. On this site you will discover the latest and greatest news, tips, and current trends in food and beverage-related industries, featuring articles that will keep you up to speed on current trends. Proper food and alcohol handling is essential for the safety of your customers and the success of your business. That’s why we provide online training courses that will equip you knowledge needed to prevent food-borne illnesses and also to maintain low insurance premiums. You can expect to find up to date information on production and distribution requirements, data analysis used to determine consumer preferences, and the innovative ways companies are learning to keep costs down. 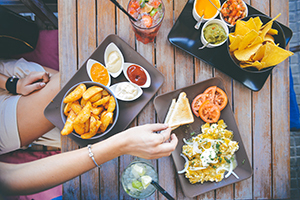 With the growing and changing needs of customers, the food and beverage industry faces the need for evolving strategies and techniques for optimizing consumer health safety and satisfaction, while staying competitive in the marketplace. Current trends in food and beverage are toward meeting the needs of an increasingly health conscious population. Now more than ever, we are seeing big changes in how the food and beverage industry operates. Large brand names like Kraft-Heinz are merging, awareness has led to improved safety technology, and the industry is becoming better at handling recalls. Health concerns have caused producers and manufacturers to focus more on natural ingredients and reducing artificial ingredients and flavors. Consumers are choosing healthy, less sugary drinks and some beverage manufacturers now have the capabilities of reusable packaging systems to cut down on costs and promote efficiency. New tactics are being used in marketing to target millennials and advancements in technology are leading to new ways of reaching a larger audience. Now is the time to take advantage of the growing opportunities to learn more about current trends and get involved in the industry! 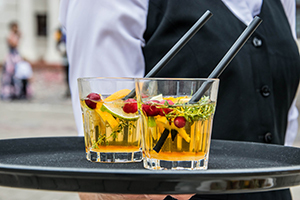 If you are looking to enter the food and beverage industry, or want to educate yourself on the certifications and requirements for food handling or bartending, you are in the right place. The first step is to learn what your state requires for certification. Then select the course that is right for you. At Train4Less, our food/alcohol training courses are ANSI Accredited and are approved and recognized by the vast majority of jurisdictions throughout the U.S.
Get your license/certification in your state for serving and selling alcohol either on-premise or off-premise. Each course teaches responsible handling of alcohol sales and ways to assure public safety when serving others. Most quality restaurants are obligated by State law to educate their food servers on proper handling techniques. Many will recommend one of these quick, easy on-line courses to obtain your certification.